Dry Pint Fruit Clamshell with air hole on top and bottom to help fruits and vegetables stay fresh. Perfect alternative to clear conventional plastic, with exact look and feel. To be used for foods item below 110F/43.3C. Clamshells must be stored below 110F/43.3C and away from heat and direct sunlight. PLA composts in 1-3 months in commercial composting facilities. 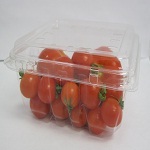 Dry Pint Fruit Clamshell is biodegradable and composable.